Get more done, your way. 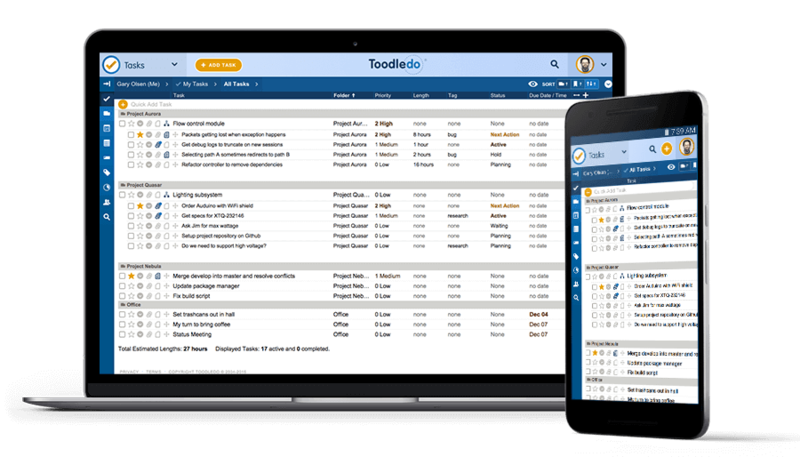 Toodledo is the most powerful task manager that you can find. With dozens of customizable features to choose from, you can create a simple to-do list or make it as complex as you like. Work with your favorite productivity methodology or create your own customized workflow. Add tasks in plain language. Sort to find important tasks. Powerful sort options allow you to show your tasks in the order that is most important to you. Each view can have its own different sort criteria so you can be more efficient. Create your own custom search criteria to drill into your tasks and find exactly what you need at any given time. Save these as Saved Searches so you can come back to them at any time. Filter out what you don't need. Quickly hide and show tasks as you need them. 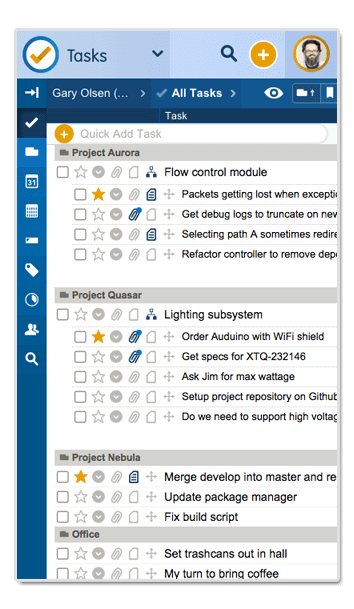 Keep future tasks hidden, or show tasks that you recently checked off. Filter by context or tag to focus your attention on what's important right now. Record your thoughts and remember your ideas. With Toodledo Notes you can record your thoughts the moment that they come to you. Later, you can quickly sort and search through your notes to find those important ideas. Automatic syncing will ensure that your notes are ready for reference the moment you need them, on any device. Format notes with bold, italics, etc. Save your thoughts and ideas forever. Toodledo will remember all of your ideas. Sort your notes into folders to better organize and style your notes with bold, italics, links, bulleted lists and other options. Quickly sort and search for notes. Need to find a note that you put into Toodledo? You can quickly sort your notes in a variety of ways, and search for a particular word or phrase. Plan your projects and stay organized. 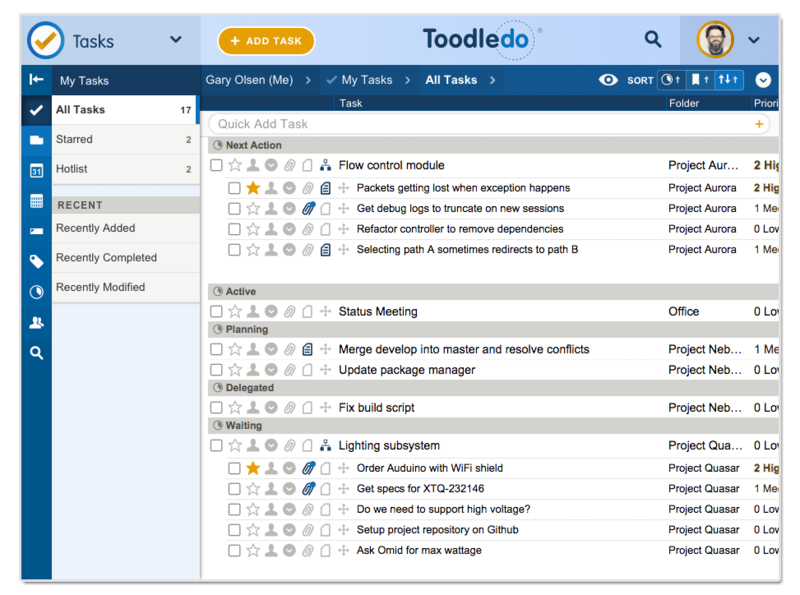 Organize big projects with Toodledo Outlines. Add hierarchy to your plan and quickly reorder items with drag and drop. Collapse sections to focus on what you need, and check items off as you go. Quickly build and structure outlines. Add and organize items quickly using your keyboard or mouse. Conveniently drag and drop rows into different sections. Once your outline is built you can switch to Presentation mode for a clean display. Create an outline and then duplicate it each time you need to run through a checklist. Or quickly un-check all the items in an outline to return it to the starting state. Share these templates with collaborators. Hide items as you check them off. Quickly expand or collapse the sections of an outline to focus on what's important. Hide or show items that you have already checked off for a clean display. Keep track of anything with customized lists. Build your own customizable lists with Toodledo Lists. Choose from over 20 different fields, such as rich text, numbers, dates, or star ratings. Lists are perfect for keeping track of shopping, inventory, contacts and much more. Customize your list with specific columns. With custom column types, you can make a list that can do exactly what you need. Use numerical columns to get automatic calculations, or add a tag, date or star. Add a phone number and you can tap-to-call it on your mobile device. Sort and filter your list. Is your list getting long? Quickly turn filters on and off to show only what you need to see. Quickly search for the row that you need. Sort your lists to show the most important items first. Automatically calculate sums and averages. Leave the calculator behind as Toodledo includes sums and averages for any numerical columns. Your totals are updated automatically as add or modify your list. Develop good behaviors and kick the bad ones with Toodledo Habits. Keep a daily log of your health, exercise, or productivity. Monitor your progress with graphs and charts to see how well you're doing at keeping your New Year's Resolutions or other commitments. Record your good and bad behaviors. Habits can be recorded as checkboxes, numerical inputs or star ratings. Each time you succeed, a link is added to your chain. Don't break the chain! Remind yourself to keep it up. Schedule your habits to appear in your inbox every day, or just certain days. Set alarms to make sure you never forget to keep up with your habits. As you record your habits over time, the line graphs and color-coded charts will show your progress. See if you've turned your good behaviors into permanent habits.